This week two players, Guy Colas and Leo Bykhovsky, took advantage of our August B-Class rating discount. Completing field were NM Ian Harris, talented expert Nicolas Checa and Director Melvin Patrick. 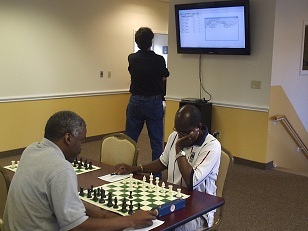 The story of the tournament however was the exciting match between Harris and Patrick in just the very first round. In their previous encounter Patrick had given Harris a free piece, but this time it was Harris’ turn! After a horrific oversight in the opening by Harris, Patrick won a piece and ran with it, never giving Harris the chance for any counter-play. This upset was one of the largest ever at the CCFC with the one possible exception being Patrick’s win against Harris from the last time that they played! That’s right, Patrick has won the two out of his past three encounters against Harris! Meanwhile, with the Patrick-Harris drama playing out the way it did, it was Checa who surged into the lead and was never caught, taking sole first place.